China is on a mission to reduce their impact on the environment, with bold new initiatives aimed at decreasing the air pollution which plagues China’s cities. It’s thought that each year in China, over a million people die due to air pollution. An oppressive grey smog hangs over many of China’s cities, and the government is turning to nature to try and help bring blue skies back to urban China. One of these schemes involves creating ‘forest cities’ where buildings are clad with a variety of plants, designed to help improve air quality. Inspiration for China’s forest cities has been taken from Milan’s ‘Bosco Verticale’ which was built in 2014, as well as a residential tower block built in Lausanne, Switzerland. Both of these projects are the brainchild of architect Stefano Boeri from the firm Stefano Boeri Architetti based in Milan, Italy. Boeri enjoys exploring the roles of urban forestation and biodiversity and how innovative projects such as vertical forests can help increase the amount of greenery in city centers. As reported by Business Insider, Boeri’s architecture firm has already been commissioned to build two forest towers in the city of Nanjing. Known as Nanjing Green Towers, they will contain a luxury hotel, museum and school of architecture as well as a combination of 1,100 trees and 2,500 shrubs across all floors. These are due to be completed in 2018, but Boeri has bigger plans in store as well. 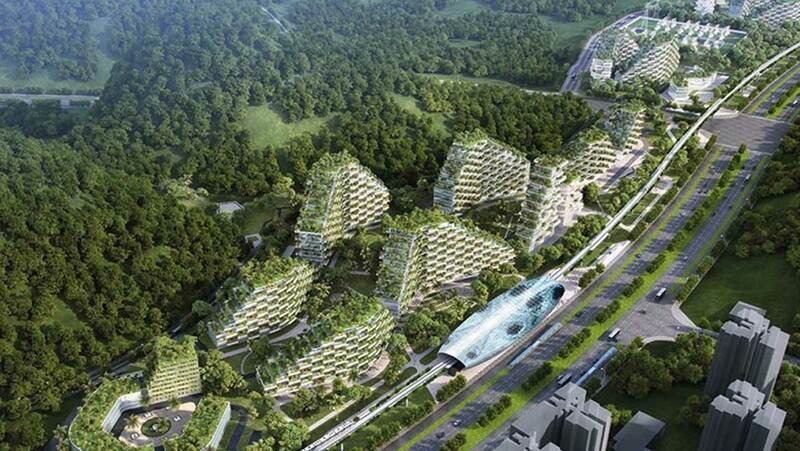 The Chinese authorities are obviously impressed with this innovative way of increasing the amount of trees and other plants in urban centers, as Stefano Boeri has just been asked to create a ‘forest city’ located in the Liuzhou area of China. Designed to merge almost seamlessly into the surrounding mountainous forested countryside, this ambitious project will contain a staggering one million plants, including 40,000 trees and over 100 different species specially selected to thrive in these conditions. The impact of this increased level of vegetation in a city is expected to be significant. It’s suggested that overall per year, the trees and shrubs will be responsible for absorbing around 10,000 tons of carbon dioxide and an additional 57 tons of other pollutants. The plants should also produce 900 tons of oxygen per year, releasing this into the local environment. As previously covered by Evolving Science, cities are subjected to what is known as the ‘urban heat island effect’ due to the high levels of human activity. As a result, cities generally have higher temperatures than the countryside around them. The addition of trees to the urban environment has a significant role to play in helping to reduce these temperatures, making city living more comfortable for residents. Surrounding urban homes with more greenery certainly makes a lot of sense. Trees and shrubs can help provide cooling shade, a reduction in noise pollution and a certain level of protection from the elements. All whilst removing carbon dioxide from the air and producing oxygen. The development of the forest city will involve the construction of new homes for 30,000 residents, along with offices, hospitals, schools and hotels. The new forest city will be based near the liujang river, and connected to the main city of Liuzhou itself by a high speed, electric railway line. The intention is not only to ensure that the buildings help absorb pollutants, but that the energy required by the residents is also produced sustainably. To that end, solar power and geothermal energy are intended to provide the majority of electricity generation for the forest city. It is hoped that the forest city will be complete by 2020, breathing new life into this province whilst hopefully providing its residents with some clearer, cleaner skies.